Art changes. When I first began writing about art and religion, it was to ask, ‘What happened to religion in contemporary art?’ There seemed very few, if any, artists making work in sympathy with religion and religious ideas. The tidal patterns of the arts can move and, when I picked up the text again five years later, I was glad to see more and new examples of faith and belief in the art world. It came as a pleasant surprise. As such, what began as a call to the faithful has turned into an exploration of how religion is perceived and expressed today in the world of contemporary art. Is religion back in the art world? If so, what is fueling this return to faith and what are the implications? I work as an artist and live in South London. I am also a Christian. I don’t make art that would be perceived as religious. Neither do I feel the need to force an agenda to discuss religion and religious ideas through my painting, yet I am interested in how my faith influences my art and how other artists approach questions of religion through their art. Much ink has been spilled over the issue of faith in art. Other artists and writers, greater than I, have observed its coming and going through the years, yet I sense a particular need to write about it personally from the perspective of someone who makes art and exhibits in a contemporary sense. A few years ago, some friends and I set up a charity to mentor and connect artists with faith. MorphÄ“ Arts ran a gallery in East London which showcased artists of varying faiths, creeds and tongues. As such, it has been my privilege to enjoy a conversation about faith and contemporary art with many artists, writers, curators, gallerists, collectors, academics and theologians for several years. Some of these conversations will undoubtedly find their way into these pages and I thank those of you who have helped me develop my thinking on these issues. Art changes as the ideologies that inform art change. I am writing about the times I live and work in now. Despite recent shifts in art in sympathy of religion, it still strikes me as an oddity today to be both a sincere Christian and an artist. It is not my intention here to bemoan the lack of Christian engagement in art or initiate some kind of therapy for Christian artists (we can save the group hugs for another day), yet I do want to talk about why those from faith-based communities often feel out of place in the arenas of contemporary art. It’s worth stating that for the purposes of this book when I say ‘contemporary art’, I’m talking about a very focused corpus of art works, artists and art institutions. At times I will talk about art made for churches or exhibited in religious institutions. Mostly, I will refer to art made by people who have been through the art school system at some point in the last twenty-five years. This is a very western and limited understanding of contemporary art, but it’s the area of the art world I find myself working in and most interested to write about in this context and this time. It is true that Christ makes a man anew, that there is some ultimate change in him. But part of that change is the ability to see life as a whole, to feel the form and unity of it, to become a creature made for and assimilated to existence, rather than a desperate, fragmented thing striving against existence or caught forever just outside it. Wiman’s writing reminds me of a fresh approach to issues of faith I have seen recently by several artists without a religious background. I think of contemporary artist Elpida Hadzi-Vasileva, a Macedonian-born sculptor who now lives in Brighton, England. She was awarded the Vatican pavilion commission in 2015 for the Venice Biennale. Her work, Haruspex refers to a class of ancient Roman priests who would perform a sacrificial ritual using the entrails of animals. As a starting point for the installation the Vatican gave her a text from John’s Gospel; word made flesh. Hadzi-Vasileva stretched the entrails of animals to create a room or tent of meeting. At the core of the tent is an omasum (the third stomach of a cow), an item steeped in Old Testament significance. Haruspex seems brightly aware of Judeo-Christian traditions and surprisingly sympathetic to them given Hadzi-Vasileva grew up under a communist regime and had no prior knowledge of the Bible before working on this commission. I wonder if her lack of foreknowledge gifted her with a fresh way of seeing the text that can’t be experienced by those brought up in a culture where Christian imagery is commonplace. I think of Michael Landy’s Saints Alive at the National Gallery where he served as artist in residence in 2013. Landy represented Christian saints as interactive fairground sculptures. Press the red button and St Catherine is spun on her wheel. Push the lever with your foot and other saints have their eyes or limbs gouged out. Landy admitted to having no prior knowledge of the saints before seeing them in paintings at the National Gallery. He talked about a happy naivety. He wanted to make art for others who are encountering the saints for the first time. There is a playful irreverence but not targeted at the saints themselves, rather at how they have been represented in western art. 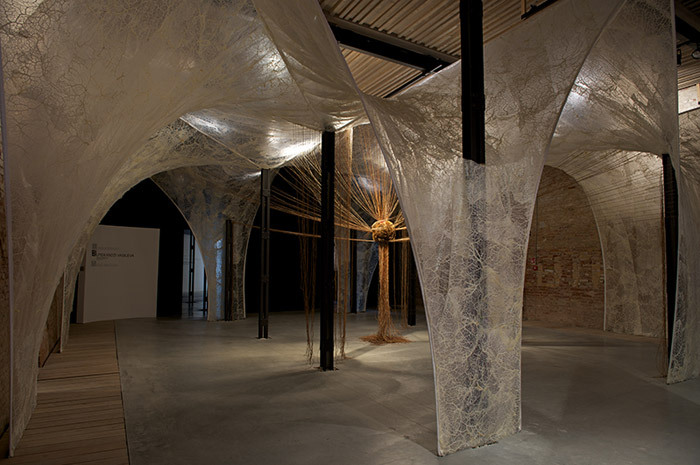 Hadzi-Vasileva and Landy seem to represent a new category of religion-based art. Their work doesn’t appear to be about religion per say nor is it out to convert you but it seems fueled by a genuine naivety or curiosity towards religious ideas that ultimately becomes expressed in a manner sympathetic to questions of faith. Religion is back, not only in political debates and the public arena, but also in the arts. Mainstream contemporary art now incorporates the kind of religious references and iconography, including Christian iconography, which, since the origins of modern art in the nineteenth century, had largely been absent. In contemporary art, a preoccupation with Christian symbolism plays an important role … One reason is that currently the theme of religion is ubiquitous in politics and the media, albeit less from theological perspectives and more as a socio-political reality. Other contemporary curators seem to share Malz’s interest in the divine. Something happened around the turning of the millennium to spark the art world’s interest in God. In 2004, artists John Baldassari and Meg Cranston co-curated an exhibition at the ica in London titled 100 Artists See God. They invited one hundred artists to respond to the age-old challenge of making a picture of God. It was a show about representation and not necessarily belief yet at its heart was a sincere enquiry into the place of religious imagery in contemporary culture. Elsewhere, The Aldrich Contemporary Art Museum in Connecticut hosted an exhibition titled Faith in 2000. The show explored the influence of Judeo-Christian religion on the art of the new millennium and boasted an impressive cast of artists including Petah Coyne, Christian Eckhart, Lyle Ashton Harris, Justen Ladda, Hermann Nitsch, Manuel Ocampo, Matthew Ritchie, Andres Serrano, Francesc Torres and James Turrell. Is religion really making a comeback in the arts? In 2015 London’s Southbank centre dedicated a summer programme to agape love, the Donmar theatre offered a sympathetic portrayal of the Bishop of London praying during the Occupy campaign of 2010 and the Vatican returned to the Venice Biennale yet again. Perhaps religion is indeed back in vogue. When was the last time you saw an explicitly religious work of contemporary art? Odds are you can’t remember. If you can it’s because it stood out like the Pope in a brothel. Religious art, when it’s not kept safely confined within gilt frames in the medieval departments of major museums, is taboo. Of course, if we’re talking art about religion that’s totally kosher. Contemporary art, I think, is as far from organised religion as Western Art has ever been, and that may even be its most singular achievement – or its cardinal failure, depending on your point of view … An observer to the art world today might well come to the conclusion that religious practice and religious ideas are not relevant to art unless they are treated with skepticism. The problematic relationship between religion and art described by Fox and Elkins may indeed have been resolved. The problems they observed five years ago seemed less with artists who make art about religion and more with those whose art is religious: that being liturgical art or otherwise designed for a church and taking Christian themes. Elkins and Fox suggested religious practice and religious ideas weren’t relevant to art unless they were treated with skepticism, irony or cynicism, but this may not be the case anymore. I would also argue that skepticism, irony and cynicism are not necessarily the foil of sincere religious belief. There are several reasons why the art world has been regarded as skeptical towards religion. At first, it’s a matter of history. Art of the twentieth century aligned itself with the progressive, rational secularity and radical subjectivity of late Modernity, rejecting the doctrine of mainstream religious ideology. As such, the ideas that fed art came from modern philosophy, liberal or radical politics, sociology and pop culture, rather than theology. At some point in the recent past, the source point for art and artists moved from religion to philosophy. Today at art school, you are not likely to read about religion unless you especially want to. Most art students instead will read philosophy in some form or another. At art school today, you are more likely to read a philosophical text by Jacques Derrida than a theological apologetic by St. Augustine of Hippo. Of course, there are exceptions and we could talk about the lasting legacy and influence on many contemporary artists of Mark Rothko, William De Kooning, Jackson Pollock and the Abstract Expressionists’ search for the spiritual. Likewise, we could consider a recent trend amongst art school graduates for landscape painting and notions of the Romantic sublime that appropriate imagery from 19th-century Romantic painters, such as Caspar David Friedrich, Thomas Cole and Albert Bierstadt. It’s also a question of patronage. In the past, the Church sponsored many of the works we now treasure in our national collections. Today, the most innovative works of art are more likely to be financed by private or public investors, including collectors, multi-national corporations, philanthropists, trust funds or stewards of public funding, such as the British Arts Council or Creative Scotland. Few of these funding bodies have a particular remit for religious art. Yet there are exceptions and recent acquisitions by St Paul’s Cathedral, Winchester and Chichester Cathedrals have all been funded by private trust funds. We could also talk about ethics. The media perception of religious people as zealots, fundamentalists or moralistic bigots does little to endear religion to an art world that quite rightly champions tolerance, open-mindedness and lateral thinking. Neither conservative Islam nor fundamentalist Christianity are best known for tolerating progressive ideas or pioneering lateral thinking. It’s worth noting a difference between religious art and art about religion that takes an objective view of religious practice and ideas. Art about religion often employs irony, cynicism or skepticism as devices to distance the viewer from religious subjects, such as Damien Hirst’s 1000 Years or Sarah Lucas’ You Know It Ain’t Easy, first exhibited in 2008, where a Christ figure, made from Malborough cigarettes, hangs from the cross of a St George’s flag. Lucas subverted the traditional materials of wood and stone and rendered her Christ in Marlborough cigarettes. We know she is being ironic from the title, You Know it Ain’t Easy, and, of course, her choice of materials. One small spark of enlightenment and Jesus goes up in an unholy cloud of nicotine smoke. The subject of You Know it Ain’t Easy is religion, but this is not religious art. It is art about religion. Yet at the same time, I hesitate to say Lucas and Hirst are taking the mick out of religion. In interview, they often come across as deeply sympathetic to those who believe, even if they would not identify as being religious themselves. On face value, their work may seem to attack those of faith, but this is only a superficial reading of their art. Looking beyond, we see signs of empathy. There is both sincerity and irony, faith and doubt. There are religious artists who make non-religious art, and non-religious artists who make religious art. Andy Warhol made no secret of his Ruthenian Rite Catholic belief, but he didn’t make work about it. At times, he made art about religious motifs, such as his replication of Da Vinci’s Last Supper, but that was more a comment on the mass reproduction of iconic images than a devout homage to the sacrament meal. By comparison, the contemporary Scottish painter, Alison Watt, is not religious, as far as I know, but accepted a commission for St Paul’s Episcopal Church in Edinburgh, 2008. Her work, Still, is a sensitive representation of Christ’s burial cloth and won first prize in the Arts and Christian Enquiry prize that year. I have talked about religious art and art about religion but there is also art that approaches questions commonly articulated through religion, yet without cynicism, irony or skepticism. Another contemporary artist, who draws from Christian symbolism, is the London artist, Mark Wallinger, whose iconic statue of Christ, Ecce Homo, won the first National Gallery commission for a public artwork on the empty forth plinth in Trafalgar Square in 1999. At the time, it stood out as a remarkably sympathetic image of Christ in an otherwise cynical art world. Surrounded by the more triumphalist statues of military heroes from Britain’s empirical past, Ecce Homo held a quiet presence, as London commuters rushed around it. The title, Ecce Homo, refers to Christ presented to the people before his crucifixion and a ring of barbed wire suggests a crown of thorns. This was a contemporary figure that could have represented any man of any faith or none, a work that presents Christ to the modern world without preaching or promoting a singular agenda. Wallinger is openly agnostic, yet also describes himself as a Christian apologist. At first, this seems contradictory, but think about the father of a dying boy, who comes to Christ for healing, in Mark’s gospel, and is exemplified for admitting, ‘I do believe, help me overcome my unbelief.’ It is possible, in art, to show signs of Christian belief, yet also harbour doubts. More recently, Tracey Emin’s I Felt You And I Knew You Loved Me (a neon light installation at Liverpool Cathedral) marries another dichotomy together. This is the dichotomy of ironic representation and sincere belief. The location and phrasing indicate a heart-felt devotion. This is a parlance to a lover or an intimate prayer that is sincere, yet the lower case ‘me’ and harsh neon material imply an ironic incongruity towards God and the sacred space. Emin is, therefore, sincere and ironic, which seems impossible, but she manages to pull it off. It demonstrates how irony and sincerity are not mutually exclusive. Religion is for lovers, for men and woman of passion, for real people … who believe in something, who hope like mad in something, who love something with a love that surpasses understanding. If you’ll excuse a personal illustration, my wife and I recently had our first child. Were we to love our baby daughter ironically, cynically or skeptically, we would sense that we had somehow betrayed a sacred bond. In a similar way, a religious artist may also feel they have betrayed their deepest convictions, if they represent God with anything less than absolute devotion. This is not to say that we cannot love rationally or reasonably. Of course, irony and love are not mutually exclusive; far from it. It seems to me that most relationships demonstrate both at the best and worst of times. It is ironic that I love my daughter when she’s misbehaving, not just when she’s being coy and cute. Let me nail my colours to the mast and state clearly that I believe in contemporary art, as a person of faith who loves contemporary art, but also as a believer in the art world itself. I have become persuaded that the arts can foster the richest discussion of faith and belief. I have certainly experienced a form of hostility from some in the art world towards religious ideas, but no more than certain individuals expressing a personal opinion. The more I consider, paint and write about the subject, the greater my faith in and love for contemporary art seems to grow. Excerpted from: Alastair Gordon: God art, Morphe Arts, 2017. Alastair Gordon is a London based artist, tutor and co-founder of Morphe Arts, a mentoring charity for recent art graduates. He is also author of Beyond Air Guitar: A Rough Guide for Christians in the Arts and lectures at the Leith School of Art in Edinburgh. Just out: GOD art, a new book by Alastair Gordon published by Morphe Arts.